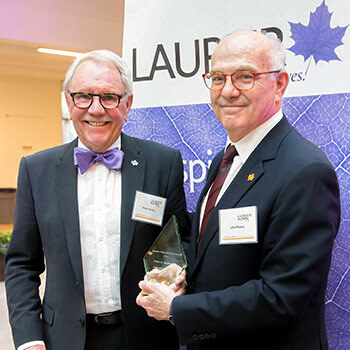 Wilfrid Laurier University celebrated donors and friends of the university with a reception in the sunny atrium of the Lazaridis School of Business and Economics on May 31. Laurier President and Vice-Chancellor Deborah MacLatchy began the evening by sharing her appreciation of donor support, which bolsters Laurier’s culture of outstanding achievement, positive social impact and student well-being. A highlight of the evening was the presentation of the 2018 Laurier Philanthropy Award to Peter Ansley. Ansley is one of Laurier’s most generous donors and established volunteers. Along with his wife, Cheri, he personally supported Laurier’s Building Canada’s Best Business School (BCBBS) campaign, helping to build Lazaridis Hall, the new home of the Lazaridis School of Business and Economics. In addition to his personal giving, Ansley served as chair of the BCBBS campaign, helping raise awareness in support of the campaign’s $55 million goal. He also inspired others to add their support, including motivating fellow Class of 1966 alumni to raise more than $350,000 in contributions to the campaign. In 2014, the Ansleys established the Peter C. Ansley Basketball Award in support of student athletes on the men’s varsity basketball team, and have provided almost 10 years of in-kind support by donating J.W. Marriot Resort packages for use in Laurier fundraising events and alumni engagement efforts. As a dedicated volunteer, Ansley has held various leadership roles over many years. He was appointed to the university’s Board of Governors in 2010 and has served on multiple committees. He is now in his third term on the Board and serves as vice-chair. Ansley has also served as a member of the Lazaridis School of Business and Economics Dean’s Advisory Councils in Waterloo and Calgary. John Bowey, past chair of Laurier’s Board of Governors, and friend of Ansley’s, presented the award to Ansley along with Joseph Fo, the 2018 recipient of the Peter C. Ansley Basketball Award. “Throughout the year, your generous gift motivates me to press through fatigue and distraction in order to complete my academic tasks, whether it be starting on an assignment earlier or studying a few hours longer,” said Fo. The program concluded with remarks by Yuchen Dai, an honours Music (Orchestral Performance) student, and 2018 recipient of the Dorothy V. and Abram Wiebe Scholarship and the Ross and Doris Dixon Music Scholarship. Dai shared with guests how philanthropy has personally made a difference in his life, and accompanied his remarks with a performance of Gavotte en Rondeau from Johann Sebastian Bach’s Partita No.3 in E major for violin as an expression to gratitude to all in attendance. This annual event recognizes individuals, corporations and foundations for their support of Laurier in its mission to inspire lives of leadership and purpose. In the past year, 3,393 donors generously donated more than $7.4 million to help enhance and expand the university and the Laurier student experience.